I love lasange, but let’s face it: it’s a tedious task that just takes too long to make. Is it worth it? Yes, it is, however sometimes you want the taste without the time but quick and easy doesn’t always mean delish. Sad but true. 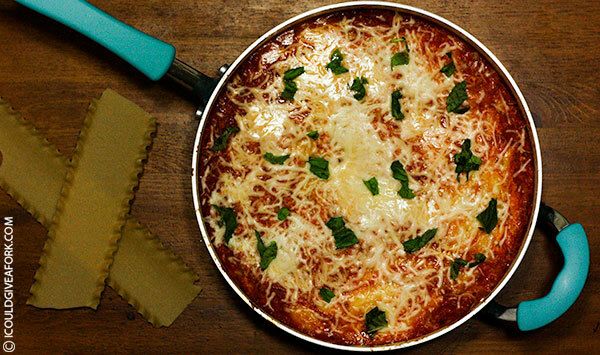 Enter gluten free skillet lasagne! Yay! I found this on the internet and decided to give it a try, and oh my goodness was it easy and delicious – SCORE. I used gluten free lasagne noodles that I found down the road at Groceryland in New Lebanon, but my box only came with 11 noodles. Would it have killed them to make it an even dozen? I guess so. Gluten free anything is just expensive, and honestly, most gluten free processed foods just aren’t as good as the original. That is slowly changing and boy am I glad. The only thing I am really missing is graham crackers, but hopefully someone will produce some good gluten free ones soon. Let’s all keep our fingers crossed, shall we? One thing to note here – always rinse your gluten free pasta. Always. Why? Because it’s kind of gritty in my opinion, but if rinsed it greatly improves, so after the soak, run them under the tap to get that “stuff” off of them and you won’t be able to tell the difference in the finished recipe – for reals. Sorry I don’t have more photos for you, but I am recovering from surgery and I had to get one of my kids to take a pic for me just for this post. *This recipe was adapted from Gluten Free on a Shoestring. If you haven’t been to her site, I urge you to go right now! In a large bowl, place the broken lasagna noodles and cover with warm tap water. Set aside. In a 12-inch skillet, heat the olive oil over medium heat. Add the diced onion, and cook for 5 minutes. Add the minced garlic, and continue to cook, stirring frequently for about another 3 minutes. Add the salt, pepper, and basil, and mix to combine. Add the tomato paste and tomato sauce, and mix. Remove the skillet from the heat and set aside the sauce. In a bowl, place the ricotta cheese, egg and Parmesan cheese and mix. Drain the water from the broken lasagna noodles, and rinse. In the skillet, layer sauce, noodles, ricotta mixture then mozzarella cheese. Repeat until everything is used. Cover the skillet and bring to a simmer over medium heat. Cook until the noodles are cooked and the cheese is melted (approx. 10 to 15 minutes). Remove from the heat, uncover, sprinkle with more Parmesan cheese and serve.